The rest of my day was taken up with gathering all my paperwork together as I will be leaving the good ship ms Volendam tomorrow in Puerto Caldera. My three weeks will be up and thus it will be time for the next one. The name of the next one I keep up my sleeve for the moment as it is cabin depending but if it all works out the next blog will pop up on April 7 from the other side of the world. 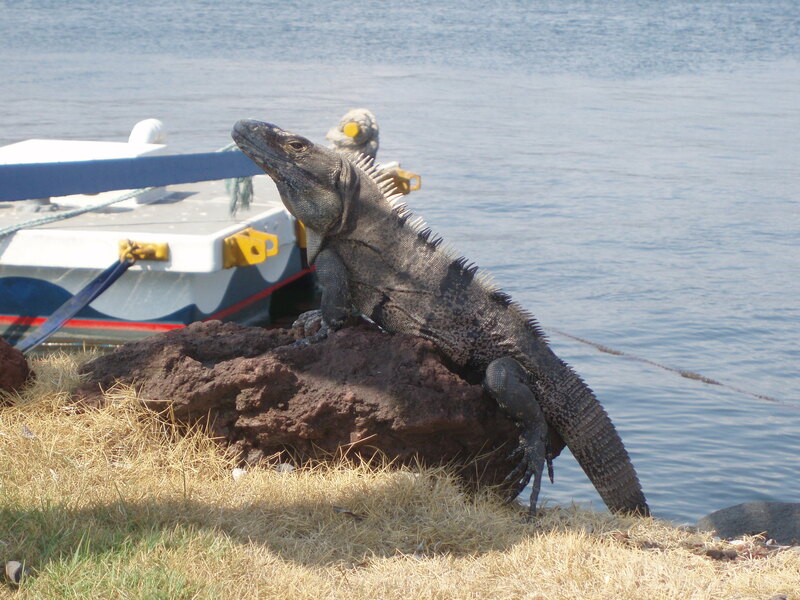 Both ports are located in the Golfo de Nicoya. But Punta Arenas is ,much deeper in the bay and the current is roaring by the dock, going even deeper into the inland bay. Puerto Caldera is along the shore in the Lower East corner and there is only tide as there is nothing for the water to roar by to. I dropped the name Puerto Caldera in the paragraph above. 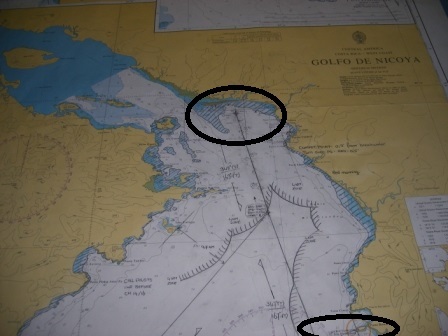 Our official port of call is Punta Arenas tomorrow but that is going to be a real challenge so the Captain has used his captain’s prerogative and decided for Puerto Caldera which is the old cargo port. We used to go here before they built the cruise pier in Punta Arenas. The reason is the tide. There is a very large tide tomorrow and to dock safely in Punta Arenas the ship has to come in very early. In the deep dark of the night. When arriving we have to wait until the tide and the current changes and then go alongside before the current becomes too strong again. That is not a great plan to start with. The moment of the turn of the current, the slack tide, is measured by looking at a buoy nearby and that is done by the captain of a local tugboat (while sitting in the dark). So our captain on the bridge (standing in the dark) is all the time completely in the dark about what the tugboat captain does and if the report given is correct and reliable. Because of the darkness there is no plan B for an own observation. During day light you can see the current swirling around the buoy but at night that does not really work. Not even with a spot light on the buoy. 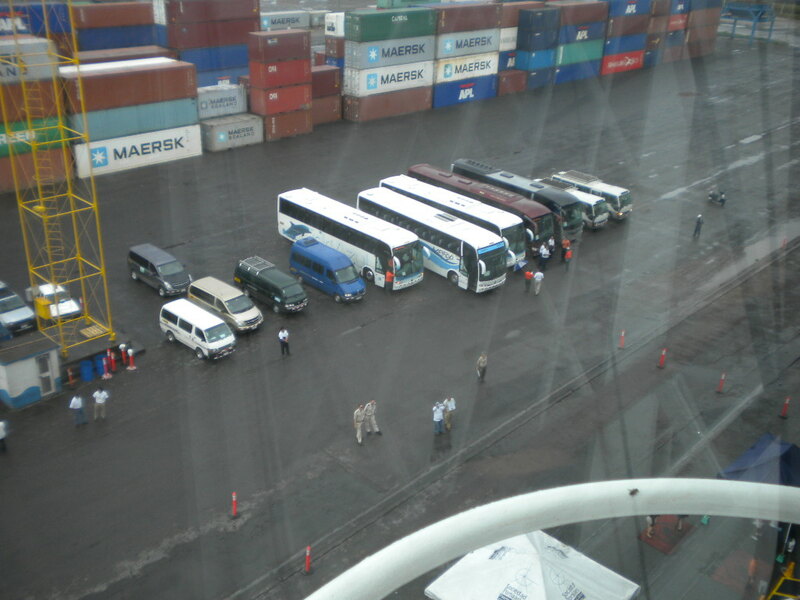 The pier is a cargo platform so all the coaches can stand in a row in front of the gangway instead of having to hustle for a space on a long and narrow pier. That is something that would make any captain nervous and thus the ship is going to Puerto Caldera, where there is the same tide but not the same current as the cargo pier here is at the end of the bay ,so there is no water flowing by. It is stopped by the shore line and the water level only goes up and down while the bay is being filled up by the racing current. Much safer to dock and much easier. So we will dock where once all our cruise ships docked until this new pier was built. I find it even an easier pier for the guests to get on and off the coaches when they go on tour and come back. For those who really need to see Punta Arenas there will be a shuttle bus service but I already heard voices: been there bought the T shirt, and if I need another T shirt I will get it from the flea market in the cargo shed. For the tours it does not make a difference, except that parking on the pier is a lot easier. Weather tomorrow: 34oC / 94oF. and very breezy. Another good reason not to be at that other pier as current and wind together can create even more challenges. So my blog will be silent for a few days, as tomorrow afternoon at 15.00 hrs. a taxi will take me on the 2.5 hrs. drive to San Jose and the airport from where a KLM plane will bring me to Amsterdam. From there I then double back to England. My apologies about the gap in blogging but I hope I will have something of interest coming up for you. The few days at home will be spent on reducing the honey-do list and that is not really an exciting topic for the blog. And there is also the highly exciting issue of deciding on the contract for our new rubbish sheds for the apartment building. I am considered to be an expert on this subject because well………………….. I am sailor and sailors are experts on everything; at least so say my neighbors. 24 March 2019; Panama Canal. Safe journey. Looking forward to your return. Travel safely, Captain. We are on Celebrity Eclipse and will be in Puerto Caldera in a few days as we head to San Diego. May your journeys be safe. Looking forward to your next adventure. I really enjoy hearing all your insights. I have gained even greater appreciation for those who sail the beautiful HAL ships. Enjoy your shore leave! Look forward to your return. Well, unless you will be dropped on us by a helicopter, you won’t be coming to the ms. Amsterdam! Too bad, would be lovely to have you! Safe journey home, so enjoy reading your posts. Look forward to future installments. Safe journey and a “home sweet home”. Goede morgen. Ik zoek de gegevens van commander D. Posthumus van de S.S. Statendam. Ik kan daar niets van vinden. Heeft u informatie daar over? Dank U voor het lezen van mijn blog. Ik ben nog druk bezig met het verzamelen van gegevens over hem. Zijn verhaal staat nog niet op de blog want ik heb zijn reizen als kapitein nog niet compleet. Maar ik heb wat ik weet opgeladen op de blog. Dus kijkt U nog eens even. Ik weet niet wat Uw interesse in de kapitein is maar als U wat kunt toevoegen aan de biografie dan houdt ik mij van harte aanbevolen.